Produce wise, I have no complaints about the past 12 months. Seasonal local vegetables from Hillsborough farm throughout the summer and a wonderful time exploring citrus varieties after that. My clear favorite was the Mayer lemon. I simply fell in love with its vivid color, fragrance and sweet/tart taste. The best priced ones were from Whole Foods, priced at a modest 3.49 /lb (about 6-7 lemons). Indulged in making 'achar', preserved lemon, Lemon rice, margaritas & a dozen bottles of marmalade! 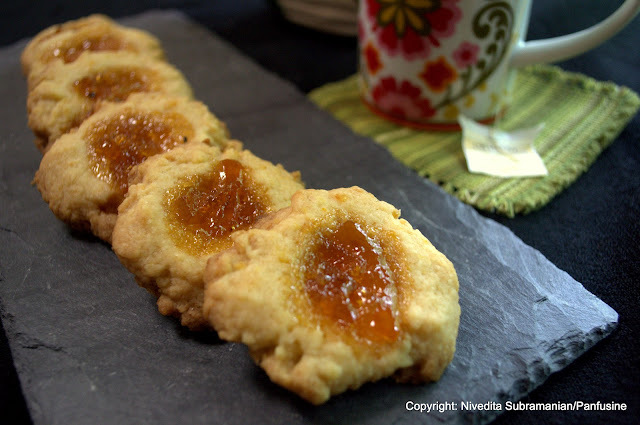 (this was in addition to a community pick testing for Food52 , a fragrant Five-citrus marmalade. Back to Meyer lemons. What? : A hybrid citrus thought to be native to China, a cross between lemon & mandarin orange. The skin is smooth and thin with minimal white pith, while the juice is not quite as tart as a regular lemon and it has a faint trace of orange, no doubt from its mandarin genes. 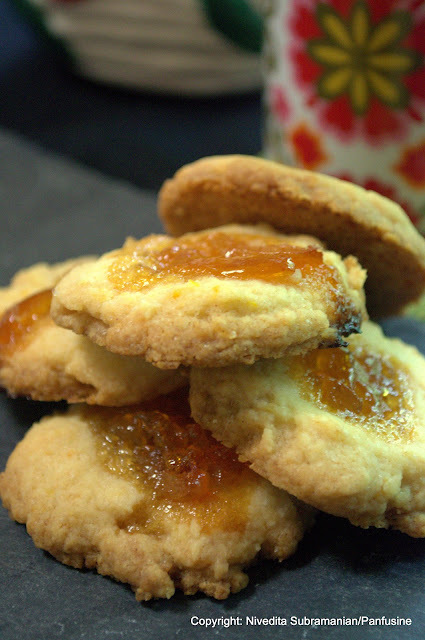 Making a marmalade, I learned, is not for the beginner cook. It requires a good hefty dose of old fashioned labor. Just slicing through 10 lemons takes time, a task which seemed trivial though after I had gone through chopping 2 pomelos (huge chinese grapefruit similar to pamplemousse better known as 'pumplimaas' in Tamil) and a generous assortment of other citrus. 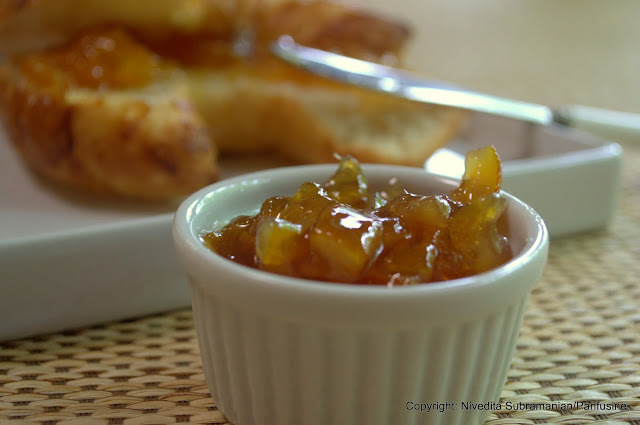 If dedicated cooking is your passion, then here is my recipe for a yummy Mayer lemon marmalade spiked with crystallized ginger and cardamom. The recipe is adapted from Epicurious.com and I believe the original recipe was featured in Gourmet magazine in Dec. 1999. 10 sterilized 1/2 pint canning jars with sealing ring lids. 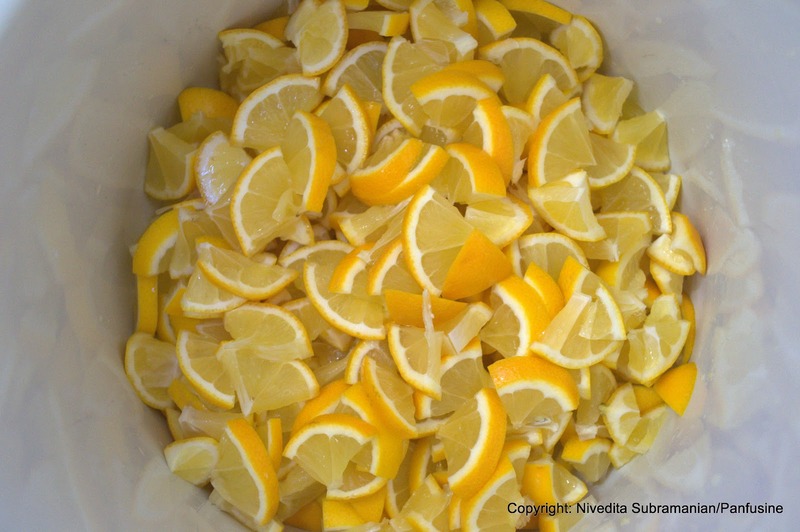 Cut the lemons once again into quarters and slice thinly. Combine the lemon, water and the bag of lemon pips in a large non reactive pot. Cover and allow the mixture to rest at room temperature for a whole day. (yes, 24 hours). 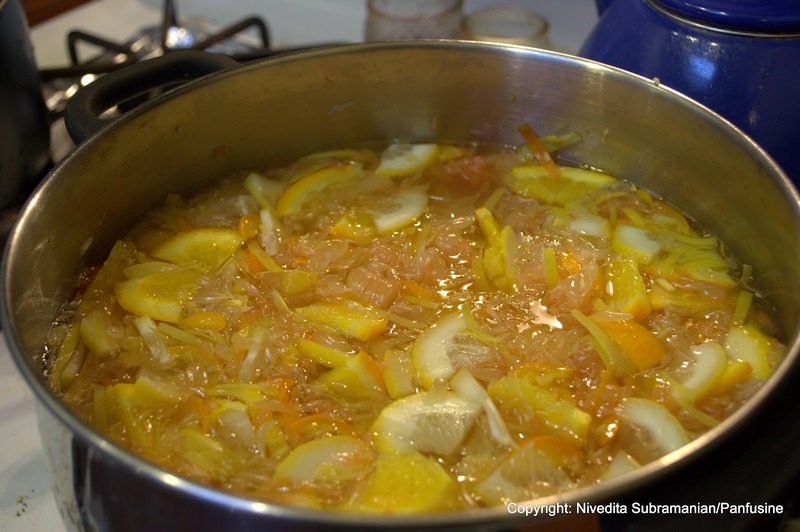 Add the crystallized ginger pieces to the Lemons the next day and bring the mixture to a boil. Reduce heat and cook down the liquid until the quantity reduces to less than half the original volume (~ 1 hr). Add the sugar and the cardamom powder and boil over medium heat, taking care to skim off any foam. Using a candy thermometer, monitor the temperature. (which is going to stay at 212 F for a LOOONG time ~ 1/2 hr). Once all the residual water has evaporated, the temperature of the thick jammy mixture will quickly rise to 220 F. Immediately switch off the heat & remove the pot. 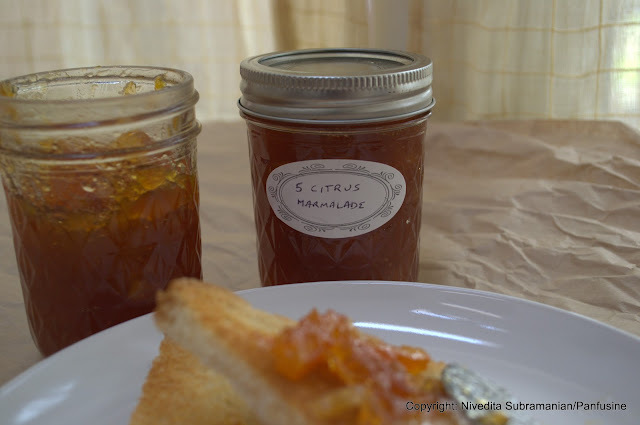 Ladle the marmalade into the sterilized jars leaving about 1/4 inch air gap at the top to allow for vacuum sealing. Wipe the rims thoroughly clean, screw on the lid & ring & tighten till the point of minimum resistance. Allow to cool slightly and then process in a vacuum bath canner. (I like to follow the timing prescribed from a post on Indian Food Rocks, viz, 10 minutes at sea level adding a minute for every additional 1000 ft above sea level, depending upon where you live). 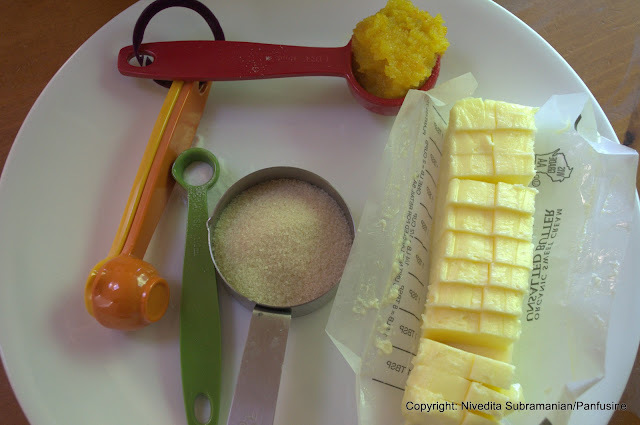 Sift the All purpose flour, sugar,salt and the baking powder together in a mixing bowl. 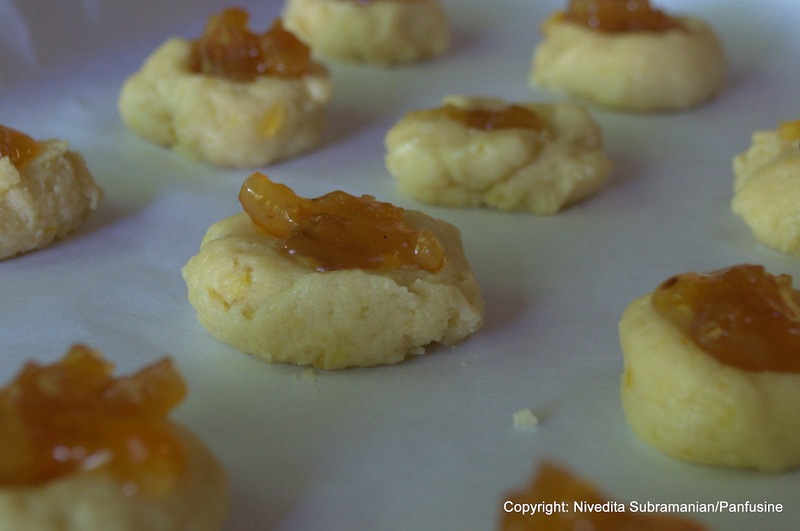 Add the butter and the orange zest (I used the frozen variety from Perfect Puree) to the flour blend. Using a silicone spatula, gently combine the ingredients together to form a dough. Gently press down to flatten. 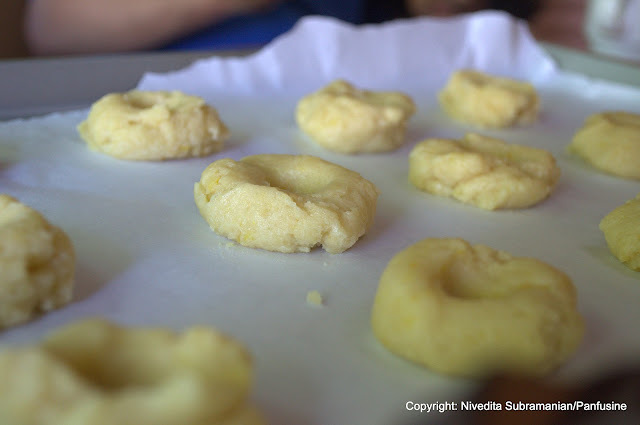 Using your thumb, make a well in the center of the dough. 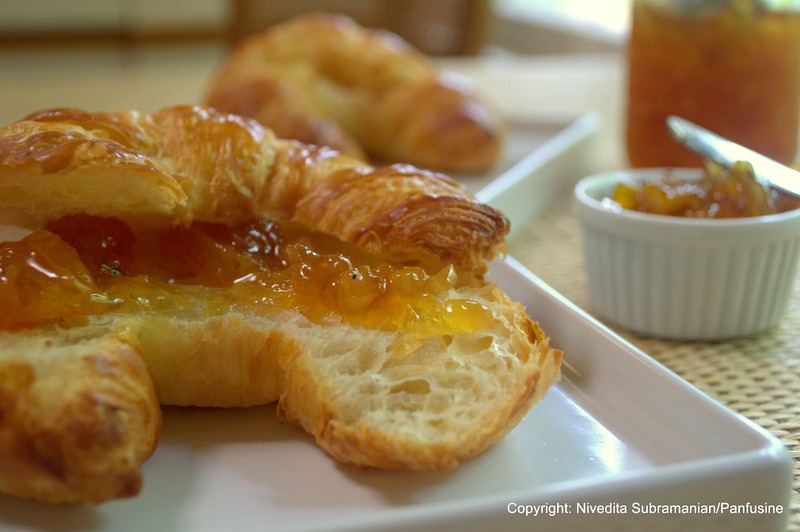 Fill the wells with 1/4 teaspoon of your favorite jam or marmalade. Cool the cookies on a cooling rack (they crisp up slightly upon cooling) and serve these rich buttery morsels with a hot cup of coffee or tea. I love marmalade and I have fallen head over heels for yours. 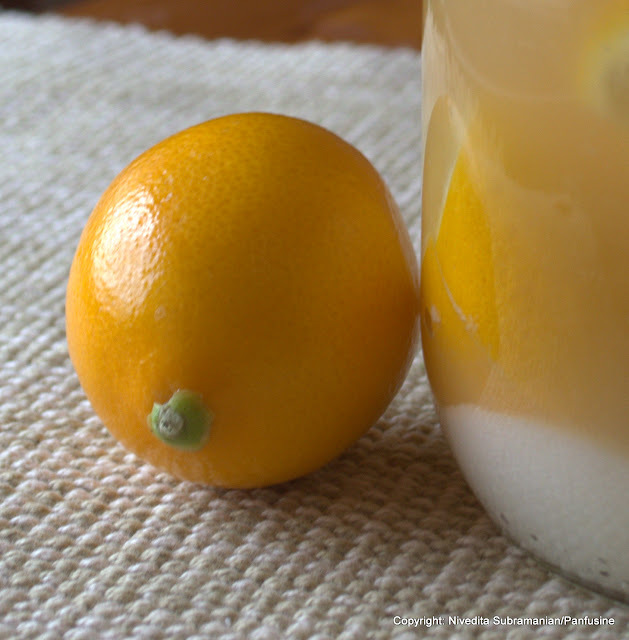 The first time I tasted meyer lemons was when a generous vendor at the farmer's market tossed in a few with our citrus purchase, they were divine. Thanks Aparna, I'm sure you'll love this! The marmalade looks yummilicious. Have never come across these lemons in this part of the world.However, I am sure this will work well for the other citrus fruits very well too. Yep, the technique is the same for other citrus as well.. (you can use 5 lemons & 5 oranges instead).. the trick is to soak the fruit for a day with the seeds.